Welcome to the 5th edition of “Meet the Pro”. If you missed our previous articles, let us quickly explain what/why we do it. A goal of Go Golf U.S. is to build a personal connection in the game of golf again. We want to help players get to know the courses, golf shop staff and Pro’s. When we see familiar faces and can add a smile or hello, it makes a better experience for all. So, to gather content for these articles, I (Alan Liwush) put the Pro’s on the hot seat for an interview to find more about them to share with all of the Go Golf U.S. community members. Having played at Ravenwood many times in my life, I have crossed paths with Mike during some of my transactions at the club. Though never formally knowing him, he was always welcoming and helpful when in the golf shop. Having such a beautiful course and facility to be a part of, I was excited to do the interview and get to know Mike better. This particular case was a little different than the other “Meet The Pro” interviews as Mike is more on the business side compared to the teaching side of golf. It was very interesting to hear as many don’t know about the business aspect of golf and the operations behind it. Without further ado, please read on for the story and golf journey of Mike Roeder of Ravenwood Golf Club. Mike Roeder works at Ravenwood Golf Club in Victor, NY. His current position is the General Manager and Director of Golf Operations. These roles allow Mike to oversee all facets of what goes on at the course. As many of the other Pro’s have said, “They wear a lot of hats” and that’s usually by design. No new comer to this course, Mike has been a part of it since 2003 when he was hired as the GM. 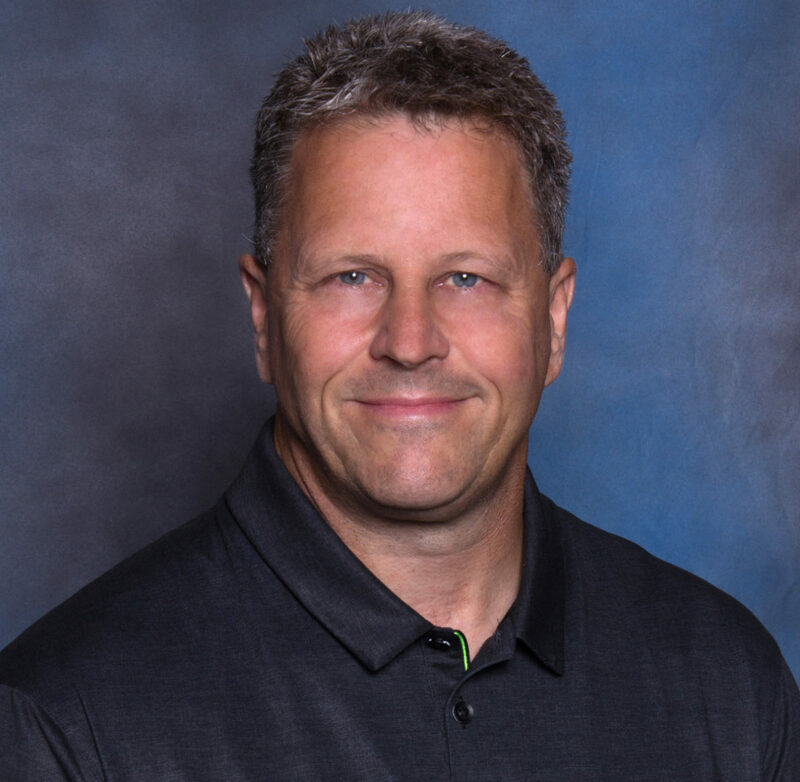 Having only been open a year before he got there, his role would be integral to getting this course ready to succeed in the competitive Rochester golf market. Food and Beverage was a big part of his role to start and he carried that into his now 14th year as they will host sixty plus weddings in 2017 alone! Originally from Minnesota, Mike went to St. Cloud State where he graduated with a finance degree. His Summers were spent working at a golf course which was his first entry into the wonderful world of golf. While others saw him excel in his position during his Summer job, they influenced him to chase a dream of working full time in golf. His next gig lead him to running a 9 hole course in Minnesota followed by chasing the sun down South to Myrtle Beach with a close friend for another job in ’87 and the rest was history. From Myrtle he went to Michigan, Florida and then to Ohio where he called home for 6 years before making his way to New York with some influence from his wife. 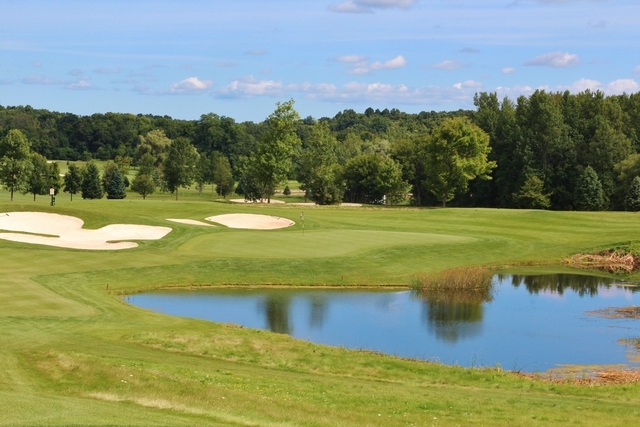 From ’95-’97, he spent his time in Binghamton at The links at Hiawatha Landing (from the pictures I saw on the site, this place is a beauty and will definitely get out there to play). From ’97-’03, he made his way to the Rochester area where he worked at Bristol Harbour (another great local track). 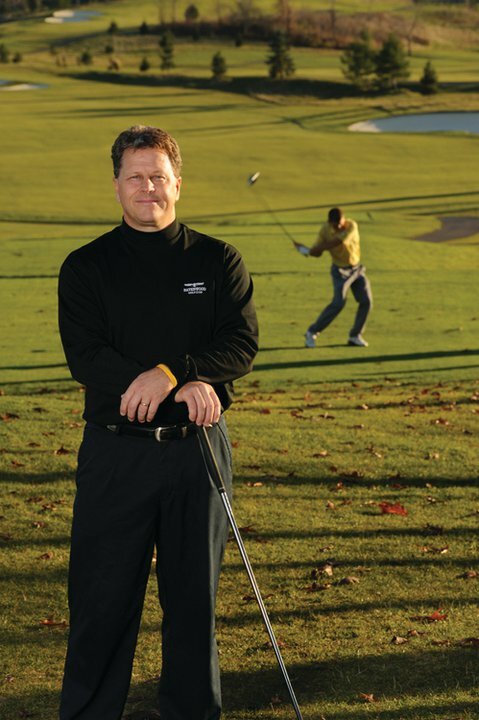 With his experience in running upscale daily fee courses, his fit at Ravenwood was perfect! Photo above is hole 15 at Ravenwood. One of my favorite questions to ask the Pro’s is, “When did you get bit by the golf bug?” I ask this because it usually takes them back to a special memory in their lives that allows them to share a great story with me. Sure enough, Mike had another good one to share. At the age of twelve, he was at a Summer school class at his hometown in Minnesota and he won a Putt Putt tournament. This victory happened to come with an over-sized trophy. The feeling of winning in sport was the first lead into his golf journey. His passion for golf was led by what many young and single men find in the game. That is having little to no responsibilities, playing A LOT and working in the business. This allowed him to pick his career path relatively easily. But, it was really the passion for the game that led him into golf. His years of hard work on the business aspect of it landed him with an office with a beautiful view here at Ravenwood. For me, hearing that Pro’s don’t get to play the game as much anymore is saddening. This is because I know they got into it from the passion for the game. Though Mike doesn’t get to play much anymore, he has what MANY don’t have, A hole in one! After I asked Mike the question if he had one, he responded with, “Yes, I actually have four.” With his stoic demeanor, he kindly told me about the most important and first one. He was 14 years old playing with his Buddy Randy at a course near his home. He said, “thankfully, the 5th hole tee backs up to the road that leads to the entrance of the golf course. Randy’s parents were leaving and they stopped to watch us hit. Of course, I told them to pay attention because I was going to hit it close! I hit it and the ball went in the hole. I can’t imagine what they would have said if two 14 year old’s said their buddy got a hole-in-one.” Good thing for Mike that he had some reliable witnesses, even though he didn’t need it because he got 3 more… Mike is currently in the lead for Pro’s I have interviewed with hole-in-one’s and will likely remain the champ! Mike’s path to becoming a Pro was through the apprenticeship program. In this program, you have to gain 36 credits. The credits were awarded by working for a Class A PGA professional and PGA affiliated facililties. The program required 36 credits (one was earned per month) and you needed to attend PGA business schools as well. Roeder attended the first business school in Myrtle Beach. The business school process is about a week long and you learn new tips from the Pro’s you work for and then test out at the end of the session. Then, you go to business school 2 about a year later after having all of the required credits. Business School 2 is more serious as you go through an open interview and presentation about what you learned. A board of directors judge if you should be given a class A affiliation or not. Your class affiliation determines the role as a Head or Assistant Pro. Mike’s class A certification led him on the path we talked about in the background section above. He climbed the rank from Assistant, to Head and then to GM and Director of Golf Ops. Through his training and experience, Mike found a niche in running new upscale daily fee facilities that need an infusion of advertising and marketing. His background in finance (which came from his studies at St Cloud State University) and having a father who owned his own business lead him to the management and business side of golf rather than teaching. Roeder said, “I did teach and was an instructor as a PGA Professional. I could still teach if I wanted to, but I prefer the business aspect instead. Those business courses in school and apprenticeship program really helped prepare me for this.” In conversation with Mike, I can tell his business savvy attitude has helped him become successful in these roles. Mike is not the only person who has said to work on the short game first. I see a lot of people who want to go to the range and pull out the driver. Big no no if you really want to get better. I also agree with taking lessons regularly. I schedule at least one lesson at the beginning of the season and it helps me out big time. Q: What are the biggest mistakes/myths you see in golf? Q: What are the biggest mistakes you see novices make ON the course? Mike is more than right on this. I too, will grab the big dog often and really don’t need it at all. Choosing the correct club around the green has been a huge part of improving my game as well. Coming from the guy who always hit a flop shot around the green to playing a smart AND safe bump and run to the pin, I have seen my scores drop big time. Q: Who are the most impressive lesser-known golf instructors? Can be local or world renowned.? Q: What’s your view on technology and golf. Two meanings to this – with equipment, everyone is developing the “farther” is better approach. & Electric/Mobile tech – more phones, apps and such. When is enough, enough? A: “You can have all the tech in the world and it’s still not going to help a lot of people get better. However, I say the more mobile tech the better. It’s fun and it keeps people more engaged. I am all for the golf apps and GPS’s. We are going to be leasing new carts next year with USB plugs. We want people playing some tunes and enjoying it. It’s part of life and you have to accept that it’s where the game is going. You have to be a part of it, otherwise you alienate a lot of people if you eliminate phones. You’ll be cutting out a lot of customers. In conversation with Mike, I love his attitude towards making golf a fun sport for all ages (within reason of course). Younger guys like to play music and as long as they are respectful, let the tunes fly. Q: What do you think golf is lacking? Pro level, am, local or regional? A: “One of the things that PGA of America has developed is team golf. You see how the Ryder Cup is so popular now and it builds a good team atmosphere. Younger people in general are more comfortable being a part of teams, so it helps with the barrier to entry. I think there needs to be more initiatives to make it more of a team sport so its not so individual. This specific question sparked a lot of talk on the subject. I myself, grew up playing golf with my parents so it was a family ordeal. Here we are 20 years later and we still go play on Mothers/Fathers Day. It really is a special part of our lives. When Mike touched on people making time for themselves, this really hit home as well. I thought a lot about my future and making sure I continue to keep the Wednesday night league or Saturday morning time slot with my buddies and keep that tradition. Thanks for the meaningful words Mike! Q: What do you think you and your team do differently at Ravenwood than at other courses? This was an amazing answer to hear from Mike. I can attest that they put their all into this course and making sure it is in tip top shape. Hearing them build on the culture at the course with “moments of truth” and “the ball always lands here” is something more companies and business’s need to implement. Mike’s Answer – “A Rain Suit.” Mike says, “I watch these kids from the High school teams come out to play and they’re so unprepared. The forecast is going to be cold and rainy and they’re wearing shorts and a t-shirt! I’ll say, Hey do you have an umbrella, rain suit or a jacket? They of course reply, No. They are just not prepared.” My Insight – I have to side with the High School kids on this one. When I was that age, I too was unprepared more times than not. Now a days, you need to have some rain gear. There is no reason to get caught with nothing in the bag. Mike’s Answer “A Flask.” My Insight – Have some fun, sip a little swing lube if you’re having a rough day but make sure to grab some in the club house as well. The game is tough and I definitely have had my fair share of days that lead me to a beverage to wash away the pain rather than in celebration. We have listed below some links to great products Go Golf U.S. recommends on Amazon corresponding to Mike’s suggestions. Q: What is one thing you offer in your golf shop you think EVERY golfer NEEDS? Kicker, has to be $99 and under. Mike’s ideas for what every golfer needs are very real. If you are in Ravenwood, grab a divot tool and pick up your favorite teams poker chip ball marker as well. It’s a small but worthy investment. Again, we have links to the products recommended below. Q: What is your favorite hole on the course and why? Photo of the view from fairway on the 18th hole shown below. Q: What is your least favorite hole on the course and why? A: "Least favorite hole on the course for me is #2. It's a short par 4 and I just don't know how to play it. The smart way to play it is hit an iron off the tee so you can hit a full wedge into the green. That's your only way to really get it close on that hole other than getting lucky. Another hole that is difficult, which is why it becomes the least favorite is #15. 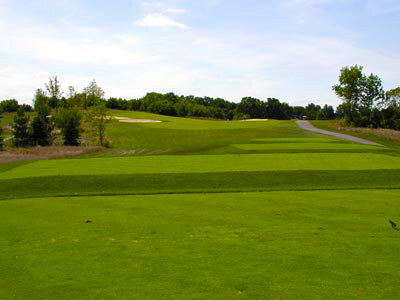 It's a par 4 on the back nine and from the tips it has an elevated green and a tough tee shot." Having played at Ravenwood many times in the past, I have to say I haven't been "lucky" too many times on #2... It seems like the real play is to hit iron off the tee and take a full wedge in rather than playing a flop shot and trying to get it close. I love asking the Pro's this question about their course to get some insight on the challenging holes. 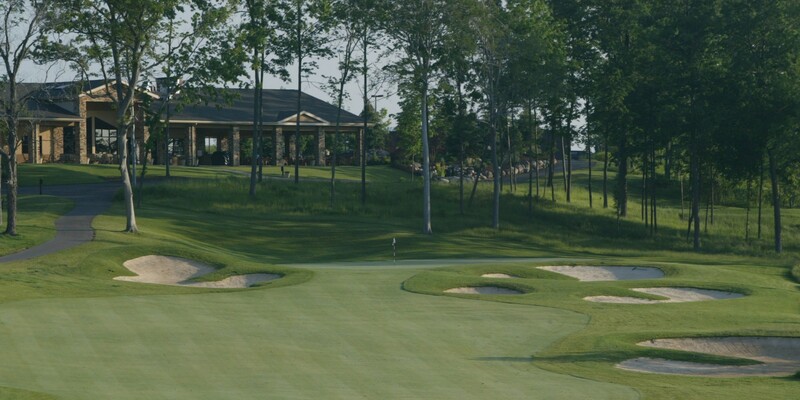 To help get Mike and Ravenwood GC’s info out there, you can find them online on their website at https://www.ravenwoodgolf.com/, on Facebook at www.facebook.com/ravenwoodgolf, on Twitter at https://twitter.com/ravenwood (handle @ravenwood) and on Instagram at https://www.instagram.com/ravenwoodgolf/ (handle @ravenwoodgolf ). You can find all of the golf rates and fess online HERE, but the general rates are $65 weekday and $75 weekend for 18 with a cart in season. If interested in a membership, please contact Mike directly. Membership pricing, is around $2400 for single and $3600 for a family, however it does have to be a perfect fit. You should plan on making a tee time. The course does do a lot for members and will squeeze them in to get them on the course as Mike says, “but to be honest we do it for all people playing”. They have had great feedback from the membership and they enjoy the course and people here. They have a good value play with a great tournament platform. That wraps up this interview! Thanks for reading our 5th edition of “Meet The Pro” with Mike Roeder of Ravenwood. I really enjoyed getting to know Mike as I do with all the interviews. His knowledge of the business side of golf he shared with me was amazing and am happy he spent the time with me.